RIM is on the final push before the launch of BlackBerry 10, with the company posting its first official teaser photo of the new hardware Monday. 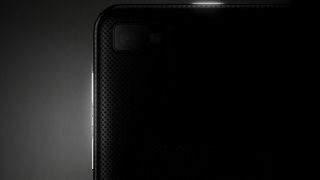 The photo doesn't show much, revealing the back of a slab phone made of textured material and featuring a camera lens in the corner. The textured material is certainly something new, looking like an quasi-mesh design aimed to give a comfortable grip. Most signs point to this as the official teaser of the frequently leaked BlackBerry L-Series. However, leaked images of the phone seem to show a flat back sans texture. There's the definite possibility the material could have changed between the prototype and final handset models...or this is another phone. The BlackBerry L-Series can't seem to keep away from cameras, with leaked images appearing across the web all last month. RIM has stayed quiet on exactly which BB10 handsets will launch early next year, though it's known that there will be at least one full touchscreen device and another with BlackBerry's signature physical keyboard. The L-Series is the former, while the QWERTY BB10 device, referred to as the N-Series, remains an opaque mystery. RIM scheduled a Jan. 30 event to mark the long-delayed BlackBerry 10 launch, and we expect the touchscreen to launch shortly after, followed by the N-Series. The Canadian firm has its work cut out for it holding interest with gradual teasers (of which we expect more) until then, especially with the shiny new handsets sure to be on display at CES 2013 Jan. 8 - Jan. 11.